VATICAN CITY (CNS) — Pope Francis’ desire for a church whose doors are wide open isn’t just a metaphor for encouraging a greater spirit of welcoming. He also has been giving real orders to Vatican staff to lift the locks on places and spaces that were long closed to the general public — the latest being the papal summer home in the hilltop town of Castel Gandolfo. The pope told him, “Arrange for opening them up” to the public, Paolucci told reporters Sept. 11 during an inaugural tour of the new offering. “It took a pope from the end of the world to give us such a beautiful gift,” Paolucci said. But the pope’s initiative goes even further by making the summertime papal property even more accessible to visitors in Rome by linking Vatican City State with the so-called “second Vatican” by a regular train service. The tiny train station of the smallest country in the world is now open to ticketed tour goers so anyone can take a specially chartered train that leaves every Saturday for a round trip journey to Castel Gandolfo, just 13 miles away. The train goes a few hundred feet before it passes the bricked Vatican City walls and enters Italian territory. It heads southeast going through Rome’s apartment-block neighborhoods and graffiti-strewn buildings. Soon it meanders across grassy fields, following an ancient Roman aqueduct along the Appian Way, until it cuts through dark tunnels and opens out onto the hills of the “Castelli Romani” regional park. Even though sightseers will be taking a regular commuter train to the new tourist destination, the Vatican Museums and Italian railway pulled out all the stops for special guests and reporters Sept. 11 with a preview of the new tour in a coal-powered steam locomotive from 1915. It had been used by the Italian royal family and once carried Pope John XXIII to Loreto and Assisi in 1962. With thick black soot belching from the smokestack and fluffy plumes of white steam whistling from the regulator, one onlooker commented that it looked like the colored smoke from a Sistine Chapel conclave signaling voting results for a new pope. But most people just shook their heads in disbelief that such a carbon-laden footprint could so closely follow on the heels of the pope’s latest encyclical, which denounces man-made causes of global warming. Tourists — taking a regular electric train — can choose two itineraries and must book ahead online at museivaticani.va. A full-day ticket for $45 starts with a two-hour visit to the Vatican Museums and Sistine Chapel. 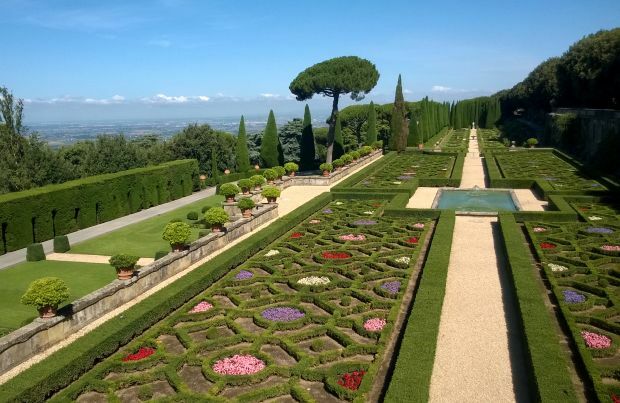 After a one-hour walk through the Vatican Gardens, there is a one-hour train ride from Vatican City to Castel Gandolfo with a one-hour mini-train ride through the pontifical gardens. The 135-acre property includes three palaces, the ruins of the summer villa of the first-century Roman Emperor Domitian, manicured formal gardens, olive orchards and greenhouses. The mini-train drives past a tiny helipad, which is how modern popes avoided causing traffic chaos with their visits, and a working farm that raises cows, hens, rabbits, ducks and honeybees. All products are given to the papal household and some are sold in the Vatican City’s grocery store. An $18 ticket includes just train transport and entrance to a museum space created in the apostolic palace. It’s the first time the apostolic palace, which houses the still-private papal apartments and the observatory dome of the pope’s Jesuit astronomers, has officially opened to the public. Six large rooms display papal portraits, historical clothing and liturgical vestments. People can get an up-close look at a “sedia gestatoria,” or portable papal chair, popes’ embroidered cloth slippers and a gold and silver desk set used by Pope Pius VIII. Visitors also can venture onto a huge balcony to admire Lake Albano — an ancient volcanic lake. Both itineraries have tourists leave the papal property right at lunchtime for three to four hours of “free time” in town before a late afternoon train back to Rome. Big crowds used to come every Sunday in the summer to pray the Angelus with the pope. But the small town’s merchants had taken a financial hit when Pope Francis broke with custom by no longer taking a vacation and spending a few months at the summer residence. The town of nearly 9,000 residents had been used to hosting popes since the 17th century and the last year a pontiff did not spend at least one summer month in the town was during World War II. In fact, it was during the war that Pope Pius XII first threw open the doors to let in what had been a record number of guests. Hundreds of people sought shelter within the villa’s walls for a few days in 1943 during a heavy Allied bombing campaign. And when the area became an active war zone in January 1944, the pope hosted an estimated 12,000 people in the neutral territory of the papal villas. The papal palace became a refuge for the town’s residents and a field hospital with at least 40 babies born in the papal apartment. Today, while there are no plans for an on-site obstetrics ward, Pope Francis continues that same spirit of offering the world refuge, this time away from the bustle and battle of most tourist destinations.